Squarcialupi is the traditional Chianti Classico line of the Farm, aimed at producing wines that express the typicality of the Sangiovese grape and the territory, limiting the use of complementary varieties. The Vintage and the Reserve are produced since the first harvest of the 90s; over time, they are defined in blands and sensory characteristics. The line was finally created with the production of the Gran Selezione, starting in 2011. The line takes its name from the Squarcialupi (XVsec) palace, in the center of Castellina in Chianti, where there are the ancient aging cellar, the direct sale, the hotel and the restaurant. The grapes are harvested by hand, then the fermentation takes place in stainless steel vats, at controlled temperature to save primary aromas; after 8-10 days all the sugars are converted into alcohol. To extract the color and the aromas, the peels that raise to the surface are moist with the must/wine. The maceration of the peels on the wine continues for 10-15 days, then the free run wine is separed from the marc, which is pressed. Follows the malolactic fermentation on fine lees for 20 days, to make the wine softer on the palate. The wine ages in big barrels of Slavonian oak (capacity from 24 to 47 hl) for 12 months, in the ancient cellar of the Squarcialupi palace. During this period the aromatic profile is defined and the wine acquires softness by polymerization of the polyphenols. Follows the refinement in the bottle for at least 3 months, before being released for consumption. Intense ruby red with purple tints.Ruby red color, decided tones with hues tending to violet. Intense notes of red fruits, especially cherry and slight hints of oak. Good structure, great softness and pleasant to drink. Predominant notes of red fruits, with slight spiciness. Serve at a temperature of 18-20°C, in a tulip glass, taking care to uncork the bottle 1 hour before serving. First courses with game, grilled meats, fresh and aged cheeses such as pecorino. Altitude of vineyards: 400-500 m a.s.l. Blend: 90%Sangiovese; 5% Cabernet Sauvignon; Merlot 5%. The grapes are harvested by hand, selecting the perfect ripening bunches. The fermentation takes place in stainless steel vats, at controlled temperature to save primary aromas; after 8-10 days all the sugars are converted into alcohol. To extract the color and the aromas, the peels that raise to the surface are moist with the must/wine. The maceration of the peels on the wine continues for 15-20 days, then the free run wine is separed from the marc, which is pressed. Follows the malolactic fermentation on fine lees for 20 days, to make the wine softer on the palate. The wine ages in big barrels of Slavonian oak (capacity from 24 to 47 hl) for 12 months, in the ancient cellar of the Squarcialupi palace and for another 6 months in barrique (225lt) and tonneaux (500lt). During this period the aromatic profile is defined and the wine acquires softness by polymerization of the polyphenols. Follows the refinement in the bottle for at least 6 months, before being released for consumption. Intense and persistent bouquet, with notes of berries and spices such as licorice and black pepper. Well-harmonized hints of oak. Well structured and balanced, complex, persistent.Notes of red fruits and spices such as black pepper and licorice. Serve at a temperature of 18-20 °C, in ballon, taking care to uncork the bottle 2 hours before or using a decanter to oxygenate. Grilled red meats, steak, game of hair and feather, stewed and roasted, aged cheeses hard like pecorino. Altitude of vineyards: 500 m a.s.l. Blend: Sangiovese 90%; Colorino 10%. The wine ages in small oak barrels, mostly in tonneau (500lt), but also in barrique (225lt), for 24 months. During this period the aromatic profile is defined and the wine acquires softness by polymerization of the polyphenols. Follows the refinement in the bottle for at least 6 months, before being released for consumption. Deep ruby red, tending to garnet in long aging. Intense, fine and persistent bouquet.Elegant notes of red and black berries, accompanied by hints of oak and spices (licorice, balsamic) that give complexity, without covering the aromatic profile of Sangiovese. Well structured, round, persistent.Sangiovese of great personality, with dominant notes of black berry fruits and hints of licorice and toasted. Grilled meat, game of hair and feather, stewed and roasted, aged cheeses with hard dough like pecorino. The Tommaso Bojola line takes its name from the owner of the Farm and is born as an alternative to the other Chianti Classico line, offering wines of personality, with great aromatic and phenolic potential. These are obtained by means of particular techniques, such as the late harvest of the bunches overripened on the plant and the vinification directly in barrique and tonneau. The blend of Sangiovese with international varieties, which represent 20% of the blend, adds further complexity, structure and body. Blend: Sangiovese 80%; Cabernet Sauvignon 15%; Merlot 5%. In the best years, part of the grapes is left to overripe on the plant. After at least 15 days from the normal harvesting period, the bunches are selected and collected in crates, guaranteeing their integrity. The grapes ferment in special barriques and tonneaux, placed on supports that allow their rotation and consequently the skimming of the skins, which are perennially immersed in the must/wine. This method allows a delicate and very effective extraction of polyphenols and aromas, prolonging maceration over 40 days. After the first 8-10 days all the sugars are converted into alcohol. The free run wine is separed from the marc, which is pressed. Follows the malolactic fermentation on fine lees for 20 days, to make the wine softer on the palate. The wine ages in small oak barrels, in barrique (225lt) and tonneau (500lt), for 24 months. During this period the aromatic profile is defined and the wine acquires softness by polymerization of the polyphenols. Follows the refinement in the bottle for at least 12 months, before being released for consumption. Complex, intense and persistent bouquet.Notes of leather and spices such as liquorice and tobacco, in balance with varietal aromas, evolved towards black berry fruits. Great structure, complex and very persistent.Elegant, with high content in polyphenols.Clear leather notes, black berries and cloves. Grilled red meats, steak, game of hair and feather, stewed and roasted. In the years where it's possible, part of the grapes is left to overripe on the plant. After at least 15 days from the normal harvesting period, the bunches are selected and collected in crates, guaranteeing their integrity. The fermentation takes place in stainless steel vats, at controlled temperature to save primary aromas; after 8-10 days all the sugars are converted into alcohol. To extract the color and the aromas, the peels that raise to the surface are moist with the must/wine. The maceration of the peels on the wine continues for 10-15 days, then the free run wine is separed from the marc, which is pressed. Follows the malolactic fermentation on fine lees for 20 days, to make the wine softer on the palate. The wine ages in small oak barrels, in barrique (225lt) and tonneaux (500lt), for 18 months. During this period the aromatic profile is defined and the wine acquires softness by polymerization of the polyphenols. Follows the refinement in the bottle for at least 3 months, before being released for consumption. Deep ruby red, sometimes with violet reflections. Intense and persistent bouquet, with notes of berries and overripe fruits. Well structured, full bodied, persistent.Great softness, gives a feeling of velvety and pleasant drink.Notes of black fruits and spices such as pepper and vanilla. Serve at a temperature of 18-20 °C, in a tulip glass, taking care to uncork the bottle 2 hours before or using a decanter to oxygenate. First courses with game, grilled meat, game of hair and feather, stews and roasts, cured meats, fresh and aged cheeses such as pecorino. From Sangiovese grapes, vinified rediscovering ancient techniques and the use of amphorae of master craftsmen, Cosimo Bojola is a wine of great territorial expression. From Sangiovese grapes with small additions of Merlot and Cabernet Sauvignon you get a cru of great elegance and structure. Height of vineyards: 400 m a.s.l. 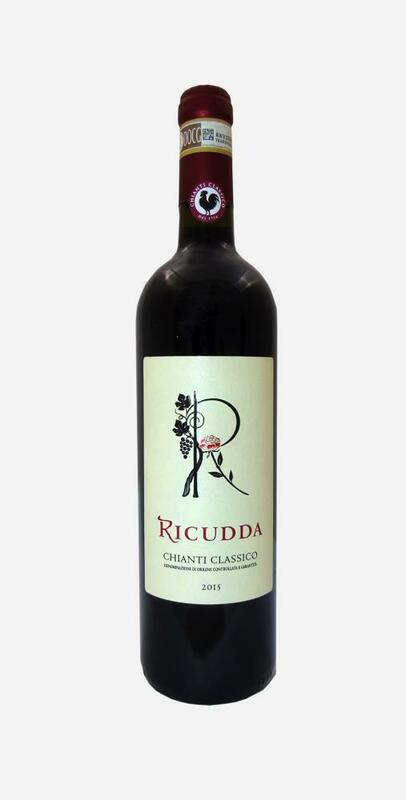 Produced from Sangiovese and Colorino grapes, cultivated and vinified in respect of the Chianti traditions.